» Reader Success! A Reader’s First Vegetable Ferment! Reader Success! 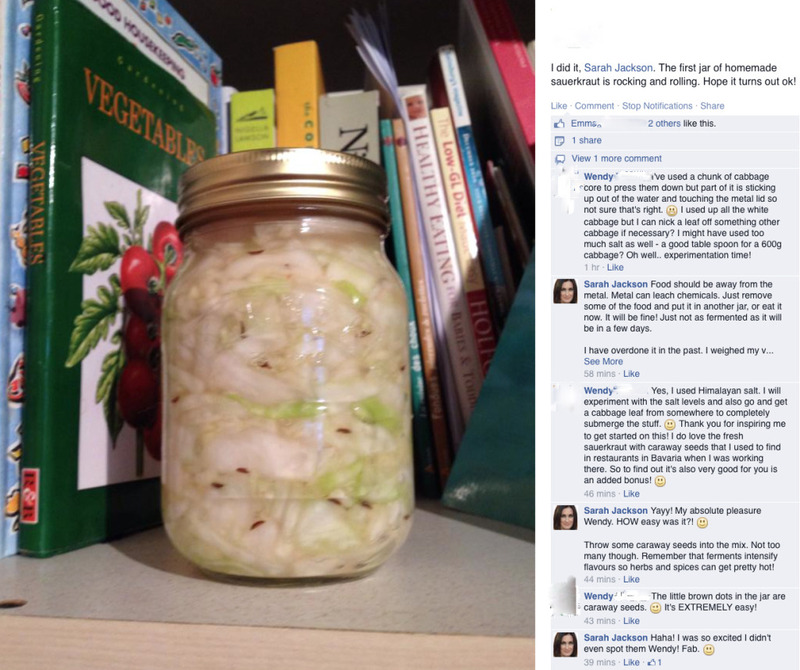 A Reader’s First Vegetable Ferment! I was pondering on which content to share with you today when a message came in on my Facebook page from reader Wendy. As a new blogger, I’m not sure of the impact my posts are having on you yet … and whether or not I’m hitting the right spot. You know. That spot that not only makes you want to read more posts, but encourages you to go buy the culture starter to create your first jug of kefir or the vegetables/fruit to pile into your first edible jar of fermented goodies. So to receive this post below made me UBER excited! So much so, that I wanted to share it with you straight away. No messing about then! You can read our conversation below. Please share with me in the comment box below what’s stopping you from making YOUR own first ferment? A business friend has asked me to run a fermented food workshop to teach her the basics to get her through this winter. We’re forging ahead very soon! It’s always lovely to have a few people around a table making food. With that in mind, I filmed this brief video to invite you to join us. I’m keeping this small, so that it will be an intimate gathering for the very first Fermented Foody workshop. But … you’ll need to be quick, as there are only 4 places! OH Sarah I would love to do this but I’m running a skincare workshop next Wednesday! Will you do another soon please? Jill, I would LOVE to! Am making a note of when is best for various people who have messaged me, as to be fair, this was a long shot, as it’s very last minute! Please can you send me a message so I can take note of whether week-time during the day, week-time evening or week-end suits you best? Really look forward to meeting you!